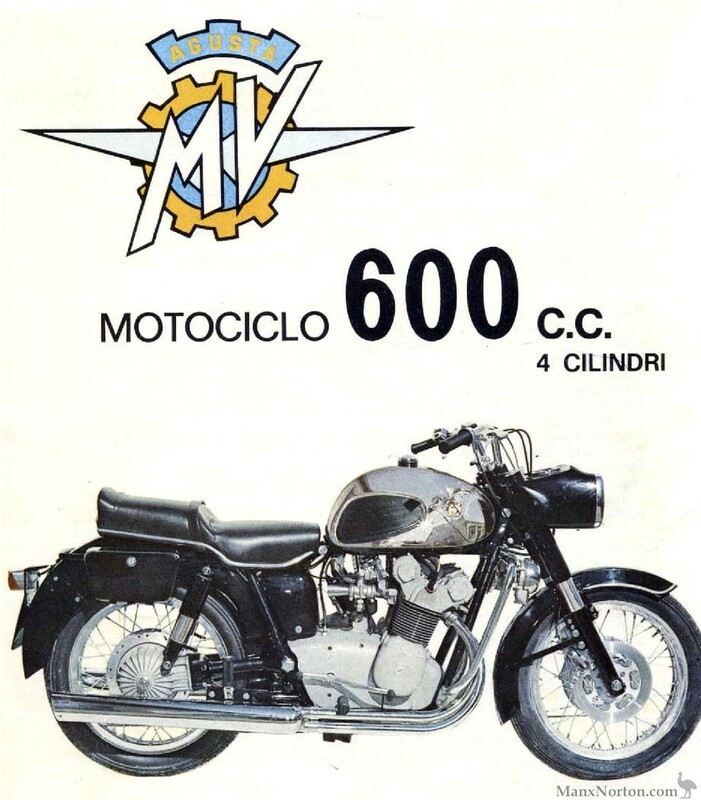 The first production model four cylinder machine, and probably the rarest as only 127* were built, all but two of which were black, appeared at the Milan Show of 1965. One of the non-noir machines was ordered by Australian art connoisseur and speedway champion Kim Bonython in mustard yellow, which he rode into his eighties. The other was blue and went to Vittorio Emanuele de Savole, son of the last King of Italy. He too rode his MV to a ripe age. Engine: Four cylinder, four stroke air coled engine - Electric starter provided - Double shaft head cames gear driven - Compression ratio: 1:9- Four cylinder side-by-side inclined front of march positioned - Bore: 58 x 4 - Stroke: 56 x 4 - Capacity: 592 cc. - Engine output: 60 HP SAE at 8.000 r.p.m. - Lubricating system - By gear pump - Oil tank capacity: 3 Kg. - Clutch: Multiple discs - Hand operated by lever on the handlebar - Five Forward speed, gear box - Driving system: from engine to clutch by gear - From engine to wheel by propeller shaft and cardan. Brakes: Front brake; double disc controlled by hand lever on handlebar - Rear brake: Drum system, foot operated. Tyre size:: Front 3.50x18" Rear 400 x 18". Performance: Maximum speed: ca 185 km/h. 118 Miles p.h. Notes: At least one source says 135 were built.